Mike Sanyshyn has played in a dazzling array of situations over the years from performing with the Edmonton Symphony Orchestra with recording artist Aaron Pritchett and acting as Musical director for the British Columbia Country Music Association Industry Awards to big concert and festival appearances. Mike is a first call studio musician, well respected fiddle instructor and judge as an artist he has released 3 CDs and an original book of music. It’s been quite a career. Mike is a 3rd generation fiddler following in the tradition of his father and grandfather. Mike Sanyshyn was born in the beautiful and rugged peaks of Coleman Alberta, in the Crowsnest Pass. He began playing fiddle at 8yrs old. Fiddle music became a passion and watching Al Cherny on CBC’s Tommy Hunter Show was a revelation. At the age of 12 yrs old Mike and his family moved to White Rock, BC. That’s where his opportunities in music began to flourish. In the midst of learning various styles from Canadian Old Time to Bluegrass, Celtic, Swing and Metis Fiddle, Sanyshyn also studied Classical music for 5yrs which helped him “get the proper technique”. “Learning to play Classical music has definitely impacted my career in a positive way,” he says. Mike was named the BC provincial Champion 4 times, placed in the top 3 at the Canadian GrandMasters Fiddling Championships, the best finish ever for a BC fiddler to date. At the age of 22 Mike was selected to play for Mercury Recording artist Duane Steele in a band hand-picked from across Canada. Their first show was opening for Nashville stars Lorrie Morgan and Sammy Kershaw. “That was my first introduction to touring and being exposed to big crowds. We also opened for Trisha Yearwood, Terri Clark, Prairie Oyster and many other acts. Subsequent opening spots included Alan Jackson, Big and Rich, Merle Haggard and Shania Twain and he has also graced the stage with Ian Tyson, Randy Bachman, One More Girl, Johnny Reid and Nashville star Luke Bryan. Mike has been featured on numerous videos for the likes of Aaron Pritchett, Chad Brownlee, Lisa Brokop and Duane Steele. He’s also performed on television including the Vicki Gabereau Show, Canada AM and Breakfast TV plus various telethons. Mike Sanyshyn is an Artist, Musician, Instructor, Composer and studio session player and is Canada’s Country Fiddler. He is well respected in the music community and is known as a mentor for up and coming fiddlers. 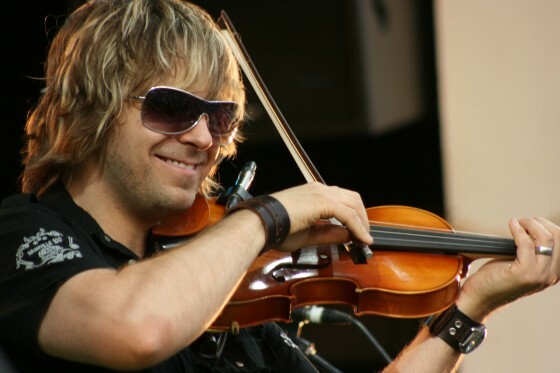 His signature sound has been recorded on hundreds of CDs and millions have heard Mike’s fiddle on the Vancouver Olympics segment in Torino introducing Whistler 2010. It’s a four stringed instrument no longer than your arm but for Mike Sanyshyn its meant 30 years of steady, varied and fascinating work. Rest assured there are precious few fiddlers, Canadian or otherwise, who can or ever will make that claim.